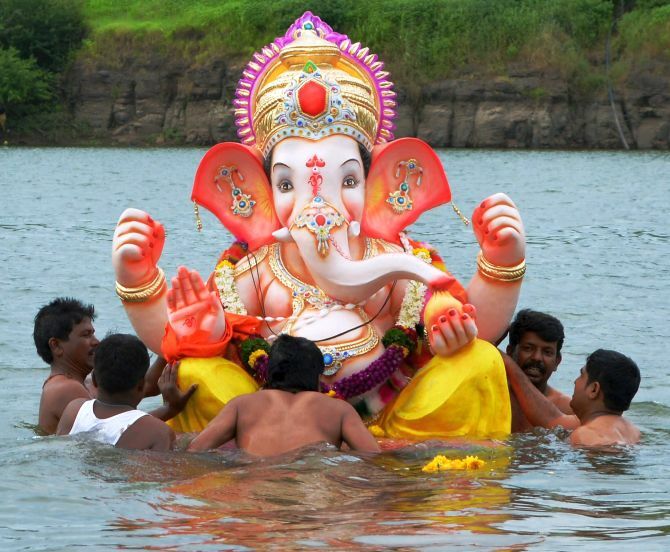 Rediff.com » News » Bye Lord Ganesha, we will miss you! 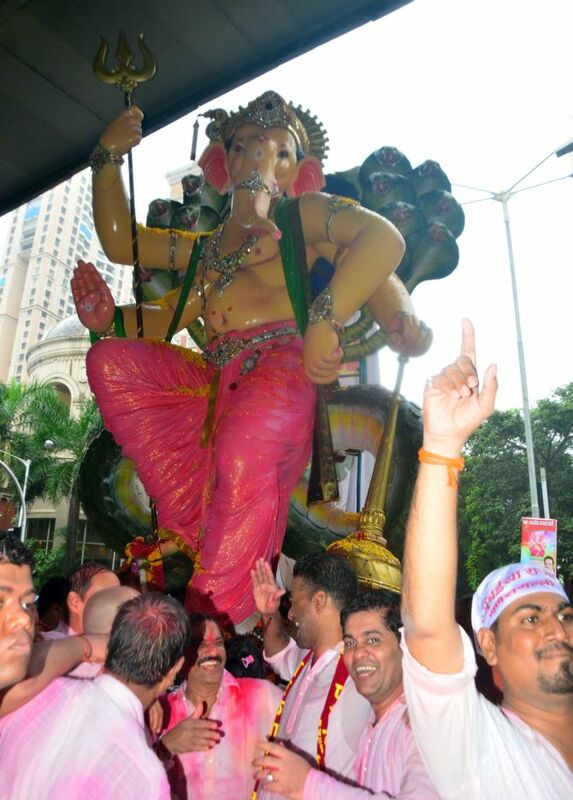 Bye Lord Ganesha, we will miss you! After spending 10 days with his devotees, Lord Ganesha returns to his abode on Thursday marking the last day of Ganesha visarjan. 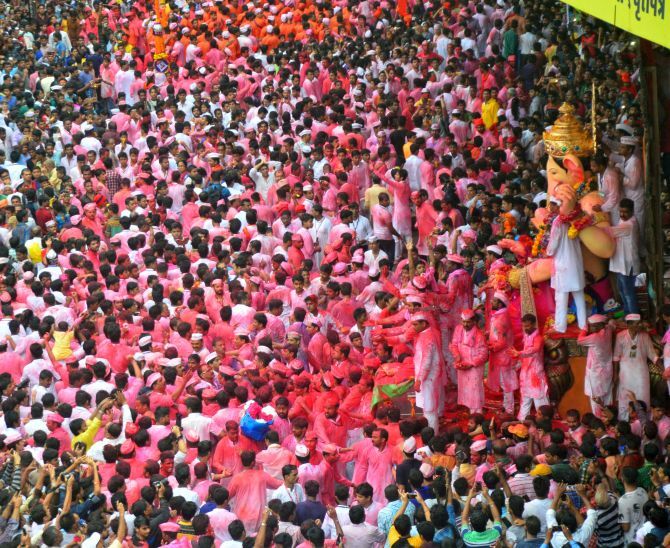 Celebrations marked the occasion with devotees thronging the streets to bid adieu to their favourite god. 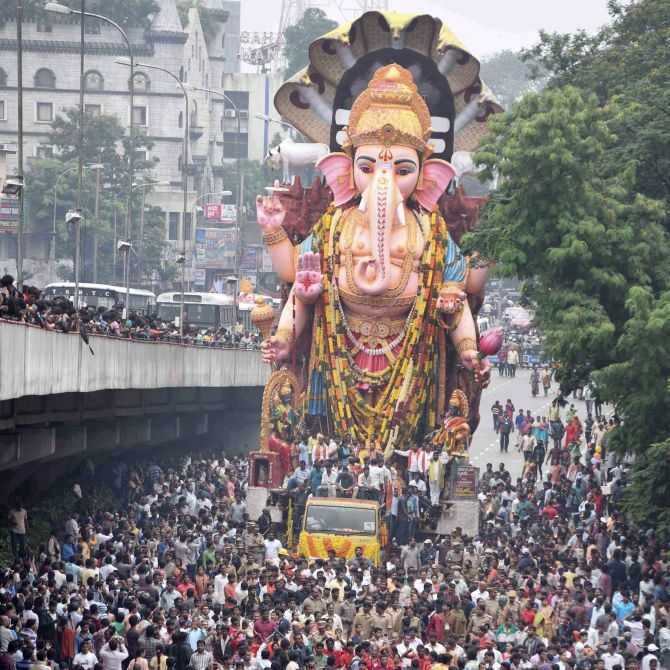 Rediff.com captures the joy and processions on the last day of the Ganesha festival. 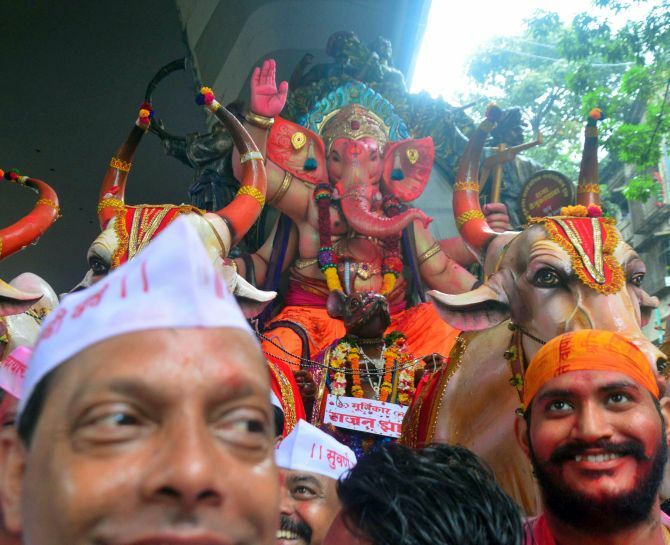 The ‘visarjan’ (immersion) processions of Ganesha idols, culminating the ten-day long ‘Ganesh Chaturthi’ festival, began on Thursday in Mumbai amid tight security and fanfare as chants of “Ganpati bappa morya, pudcha varshi laukar ya” filled the air. 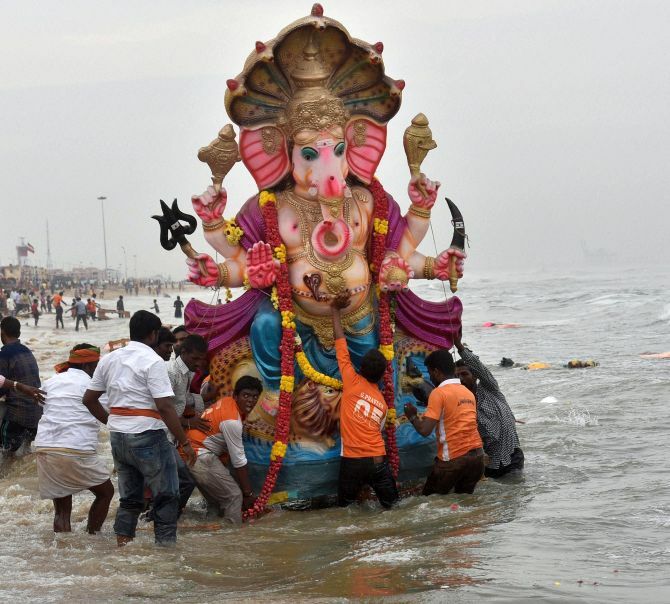 The processions are likely to last for the next 24-30 hours with devotees and chief of Ganesh mandals dislodging the statues of the deity and immersing them in the sea, natural or artificial ponds. 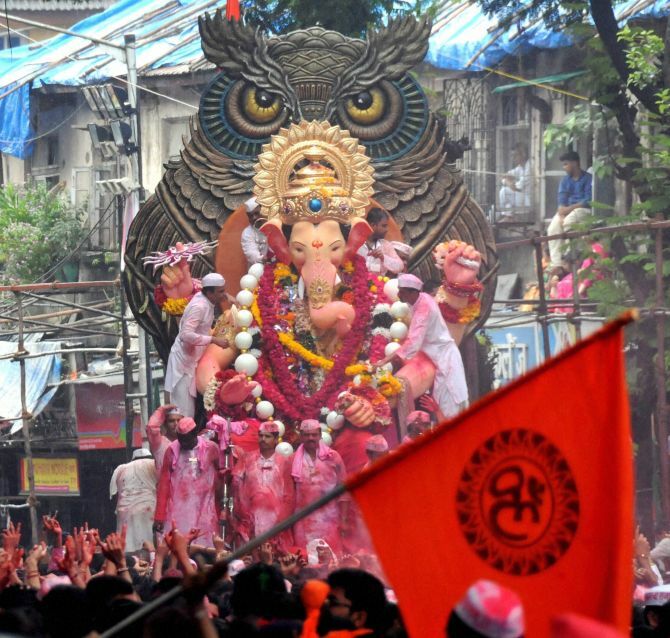 The morning downpour could not dampen the spirit of the revellers, who were seen on the streets singing and dancing, while bidding final adieu to Lord Ganesha. 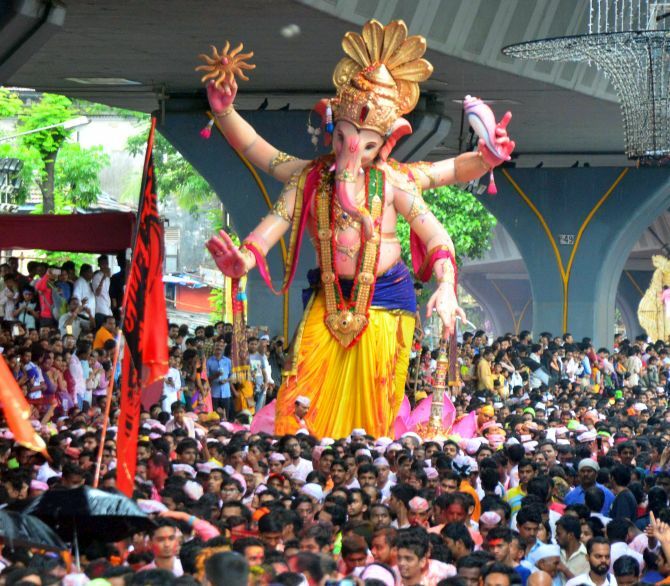 Meanwhile, civic authorities claimed to have made elaborate arrangements for lakhs of devotees who will gather for the final festivities of famous Ganesh pandals, including ‘Lalbaugcha Raja’ and ‘Ganesh Galli Cha Raja’. The civic body and city police have made adequate arrangements including deployment of choppers and drones to ensure smooth immersion procession. A total of 31 artificial ponds have been created for immersion while there are 69 natural ponds across the megapolis where people can complete the ritual. Also, 607 lifeguards have been deployed, 58 control cells and 74 first-aid centres have been set up in the city. Moreover 81 motor boats and 60 ambulances have been kept ready, it said. Besides 118 portable toilets have been set up by the civic body. As many as 5,173 employees and 2,382 officers will be working to oversee the immersion. Mumbai Mayor Snehal Ambekar and civic chief Ajoy Mehta in a joint statement appealed devotees to inform the civic authorities as and when they need any assistance or if they are stung by jelly fish or sting ray. Civic body has estimated that over 50,000 idols are likely to be immersed across the metropolis. Police have beefed up security and companies of the State Reserve Police Force are also being deployed. 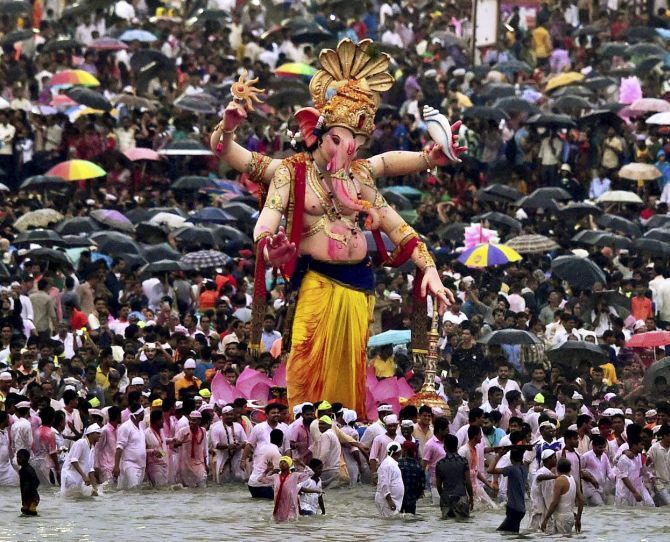 “We are in touch with all the concerned agencies and have made necessary arrangements for a smooth ‘visarjan’ (immersion),” Mumbai Police spokesperson Ashok Dudhe said. 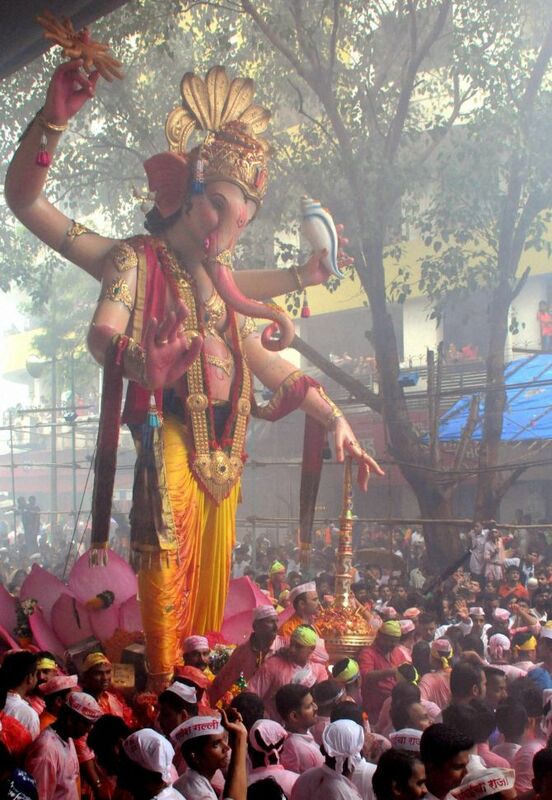 “Apart from our full strength, cranes, watchtowers, drones, coastguard helicopters, CCTVs and floodlights have been arranged to keep a watch on every movement of the revellers and devotees,” Dudhe said. A senior police officer said leaves of almost all the security personnel have been cancelled in view of the immersion. “A strong team of all assistant sub-inspectors, constables, women constables along with hundreds of women officers have been deployed to maintain law and order during the immersion,” said the official. Also, several traffic constables have also been deployed at prominent locations to control vehicular movement.